Let’s Talk – Procrastination Is My Enemy – Tea Time! Over Coffee. I’m pretty sure that procrastination is going to be my downfall in life. I have so many goals and to-do’s that I want to accomplish, yet I haven’t put in the work that I know needs to be done. For some crazy and amazing reason I have this notion that I can always start tomorrow. As we all know this isn’t the best ideology to have when it comes to striking our goals. So with that knowledge, why is it so hard for me to do the work I know I need to do in order to move forward with checking off my goal sheet. Luckily for me some psychologists have already done some research to delve into why people procrastinate. There are many reasons we give ourselves as to why we procrastinate, or put things off. As listed in the article “The Psychology Behind Why We Wait Until the Last Minute to Do Things” by Kendra Cherry, we can put things off because we don’t feel like it, or we need to be in the right state of mind, or even that we simply just don’t know how to get started. I could easily identify some of my own reasons among list people give as to why they put things off. Sometimes I tell myself that I need to look into how to start up the project, or I may be waiting for something inspiring to occur that will push me to get the ball rolling. Experience has shown me that waiting for inspiration rarely helps and putting off research only pushes deadlines out unnecessarily far. There was also a mention of fear of success or failure being mentioned in the article “The Real Reason You Procrastinate – And How To Stop” on the Wonkblog by Ana Swanson. I hadn’t quite put much thought into that possibility before reading the article, but thought to myself that maybe I am afraid. As much as I would love to begin and conquer all of my goals I know that being successful would then require me to become more consistent and diligent in producing more of my work. Although this is exactly what I would like to happen, I am afraid of the change from working for a corporation to working for myself. The responsibility of managing my own work load and revenue is a bit terrifying and I wouldn’t know what to expect. I’m also afraid of failure. Looking at the work that I put in to create content and share with the world takes courage in itself and if all my work were to be in vain I would be devastated. However, by procrastinating and putting things off, I’m cutting myself short of my full potential, thus not knowing if I will win or lose, but rather, I am stuck in the middle. I neither win nor lose. I will never know how well I can become because I haven’t stepped out of that comfort zone to test my abilities in being successful. By not failing I will never know how I can improve and reach a broader audience. I know for a fact that I want to be someone that communicates with the world through my words, my voice, my humor, and my open mindedness to the world around me. If procrastination is something that I continue to do, I won’t allow myself to know what it is like to be consistent in putting out content and building an audience. People are drawn to things that are constant. So, in order for me to see growth I have to learn to be consistent and disciplined in what it is I would like to accomplish. I cannot depend on others to complete it for me and I cannot assume that I have plenty of time to get started. 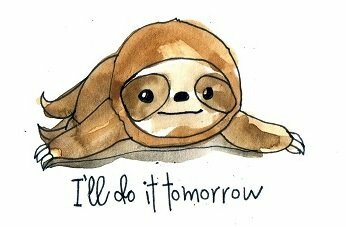 In Psychology Today they also touch on procrastination in saying that allowing the mood of “I don’t feel like it” to motivate whether we complete something or not can lead to a path of negative emotions negating our ability to begin tasks. There is also the deception that waiting to the last minute helps with work productivity. This is also a fallacy. This, among the other reasons we give ourselves, is just another form of self-deception. In the end, with practice, self discipline and a plan, procrastination can become a thing of the past. As with any habit, it will take practice and determination to transform the way we think about upcoming difficult tasks and how we plan to tackle them. I know specifically for myself that it won’t be an overnight change, however, I believe that with the correct frame of mind and a laid out itinerary, I can change my habit of putting things off.